This is another release from one of the actually most prolific mapper. that decided to make a release for COD2 because he made several for COD1 (and so he knows the editor well) and also because there was a lack to COD2 sp releases. Even if there is no real story it's an easy to handle release, you will need to progress mostly forward without no objective or puzzle to solve, just eliminate enemies to get further till you will get a black screen and end the map with the ending anymation of COD2. Design is well put together with a good looking to scale, realism in a mix between outdoor and indoor places. Every new place you will visit lead to some ambushes or attack from enemies from all type (witch look a little unrealistic to mixed different german type of model in a 'so' small town). 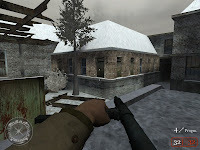 Use of texturing (outdoor and indoor) perfectly fits to a snowy city during WW2 but lack perhaps a little of atmosphere. 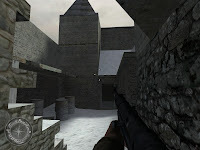 Gameplay is correctly balanced beween open area with ambushes and tiny cave or storage room where grenades are highly damagable. I would have prefer to encounter a little more variety in gaemplay through some scripting or updating objectives that could have also create some 'saving' position which are totally absent from start till end (so if you die you restart from the beginning). In conclusion: This map like all other releases from Leon is really well design in a really short time (5 days). Regarding the time he spend and the way he did this map it's a perfect enjoyable release well worth to play. I still stay a little disapointed to the potential of this map that highlights defenetly through it's design but lack of a general good atmosphere.